They carry it back to the colony and they all die! What’s so cool about this is, it took them 2 minutes to find it and 5 minutes to fill up like the pic! Powdered sugar is essential. You cannot use the larger grains of sugar for this. Mix the two powders together and then place small amounts against the walls or other areas where you would not normally walk, but where you would normally see the ants. The ants will be attracted to the sugar and will eat some of it and collect more to take home to feed others, so all of them will get their share. The sugar and baking soda powders are similar in size and, once mixed together, the ants cannot separate the two items, so, as they eat the sugar, they will also ingest the baking soda, which they would otherwise never touch. This is the reason for using powdered sugar. 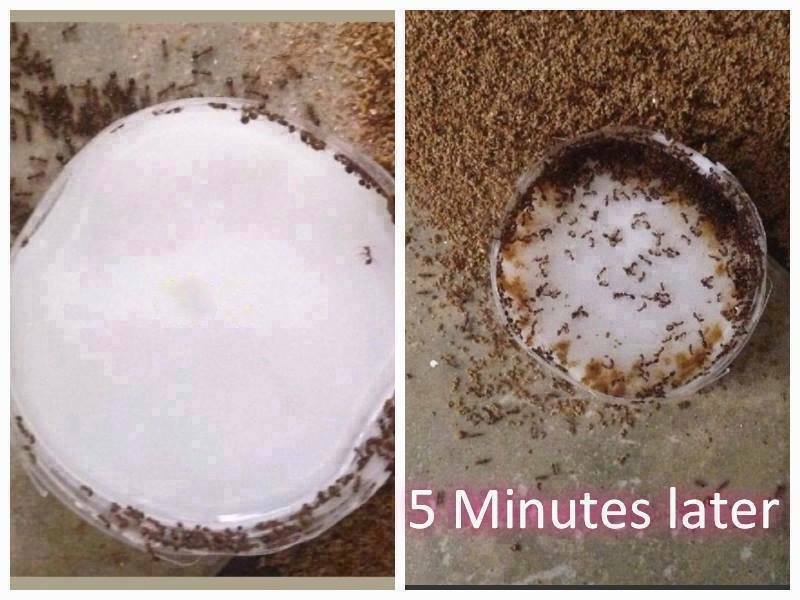 Once the ants eat the baking soda it will react with the formic acid in their stomachs and cause gas. The bodies of ants are unlike humans and they cannot eliminate gas so it will build up inside them and cause them to literally explode. Check out more -> household tips! Would it work on termites? Have you had any experience with ” crazy ants” ? Have they come up with a solution to get rid of them yet ? What works on hobo spiders? hi would you know if this works on carpenter ants ? I just now have an invasion of ants, blank, red, and black and red. I’ll try this. Not all ants eat sugar. Some are attracted to salty substances. Did ya know that? Powdered borax in peanut butter for them or powdered borax in jelly for those with a sweet tooth. Powdered Borax is a great roach killer. It is like glass to all Exoskeletal bugs. While I like the idea I’m a little reluctant in trying it because of my two dogs! What happens if dogs lick this mixture? Do you know of anything that will deter gnats. Our yard is full of them. We live next to a pond but not sure if this attracts them or not. If we go outside they immediately cover us. Hard to shoo them away when we decide to enter our home. Any suggestions are most appreciated. Mix vanilla food flavoring half and half with water in a small personal spray bottle. Spray on when you go outside. Works on knats, mosquitoes and flies. I use it all the time mowing the lawn. May have to respray occassionally. could you do this recipe on mice? Mice fart. They “eliminate gas” so this won’t really do anything to them but make them gassy. Ive heard if you mix equal parts of corn meal and plaster of Paris in jar and shake vigorously until consistent color. Leave in small dish where you see mice. Place bowl of water near corn meal mixture. The powdered mixture will make them thirsty. Mice don’t actively search for water as they tend to go for moist foods. If something is dry they just won’t eat it if there is an alternative food source. They only need 3 g of food per day. There is no quick-fix to elimate mice – anticoagulant rodenticide is your best method. As they feed from numerous sources you need to place small amounts in lots of areas. Thanks for all you share on face book. Keep them coming. I know it is a lot of work you, thanks !!! Thank you for the recipe I’m gonna try it.